The education technology experts at SchoolMart.com explain the functions and capabilities of TI’s newest product, created to continue incorporating STEM initiatives into classrooms. Joining a series of new programming and STEM-oriented classroom tools, the TI Innovator promises to provide middle and high school students with authentic hands-on coding and engineering experiences. The hardware is a small box called a ‘hub’ which contains a microcontroller. One or more graphing calculators can be plugged into the hub in order to expand the calculator’s functions. This enables the tool to perform actions such as programming patterns of sounds, among others. 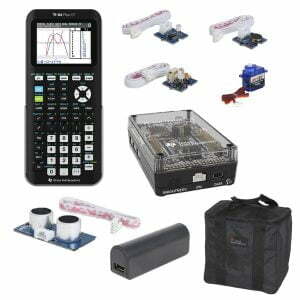 Texas Instruments’ TI Innovator is an excellent tool for teaching programming in the classroom. It allows multiple TI-84 Plus graphing calculators at once to connect to its hub, giving students a chance to do experience hands-on programming activities that stimulate interest in STEM initiatives. The experience of using the TI Innovator to learn coding should feel authentic, because it is; Texas Instruments modeled the Innovator after the more complex TI LaunchPad Board, which is used by the world’s leading engineers. With this product, TI expands its reach into the classroom technology market. The use of computing products need not stop with calculators – they can now be used in order to gain a deeper understanding of programming capabilities and engineering design. The TI Innovator was designed with classroom use in mind, and as such is encased in a hard plastic case meant to endure rough treatment and jostling. The success of the TI Innovator will depend largely on how successful Texas Instruments will be in developing a following for the product. Educational tools for computer programming require a following to receive adequate feedback for subsequent software and hardware updates. Pilot programs have already hinted at the product’s success in establishing student interest in its continuation and development, which in turn will lead to teacher buy-in. The TI Innovator’s ultimate purpose is to introduce advanced STEM concepts into the classroom in a way that enables students to enjoy and engage with the technology without realizing they are learning key programming principles. According to recent users, the product is reaching its goal effortlessly. For more information on how to incorporate products like the TI Innovator into your classroom, contact the education technology experts at SchoolMart.com today.